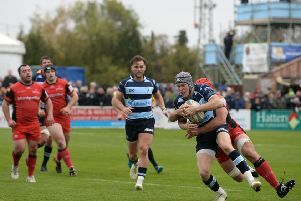 Bedford Blues’ hopes of reaching the British & Irish Cup quarter-finals suffered a huge dent on Saturday as they lost 40-23 against Ealing Trailfinders at Vallis Way. The two teams had drawn 19-19 in their league encounter the previous weekend, but a much-changed Blues were well beaten this time. It took Ealing just a few minutes to score their opening try against the Blues when Curtis Wilson sped over, with Aaron Penberthy converting. The Blues were on the scoresheet though Myles Dorrian’s penalty, although Penberthy slotted one of his own to make it 10-3. Soon afterwards, Ealing’s pack trundled forward with Mark Bright crossing the line and Penberthy converting. Blues then enjoyed a sustained period of pressure, leading to another Dorrian penalty. However, Ealing’s clinical nature saw them cross the line again as former Blue Seb Nagle-Taylor touched down, Penberthy adding the extras. Bedford fell further beind when Phil Chesters was played in by Lewis Jones to score in the corner as Ealing swapped ends 29-16 in front. Penberthy converted his second penalty, as Bedford mounted some kind of response, a well-taken try after good work by Michael Le Bourgeois saw Dorrian who raced away to score, before kicking the extra points too. Penberthy added a third penalty before Matt Cornish went over too, before Bedford were to score two late tries in the final few minutes. The first came from replacement Jake Sharp who crashed over the line before Jordan Burns showed a fantastic turn of pace to rush over the line deep into stoppage time. Blues are back at home in the league on Boxing Day as they host Jersey Reds at Goldington Road.